Yes, the La Scala Butterfly. Love your Cremina, the white case is beautiful! Got a day or two to let the Sweet Blue degass, roasted on the 23rd. My first purchase from Redbird but have read so many good things. Plus Daterra... ! Thanks! Enjoy the Sweet Blue! i think i'll have to try some redbird myself. (02-26-2017, 10:03 AM)ColdRiverSoap Wrote: Looks like I've got some Single Origin espresso shots to run through. I feel like I should get a sales trophy from Redbird based on how many people I've turned onto their coffee at work. I think my work coffee "cartel" is at 2 capos , and 3 or 4 customers. Haha. We all chip into whomever is ordering to save on shipping. 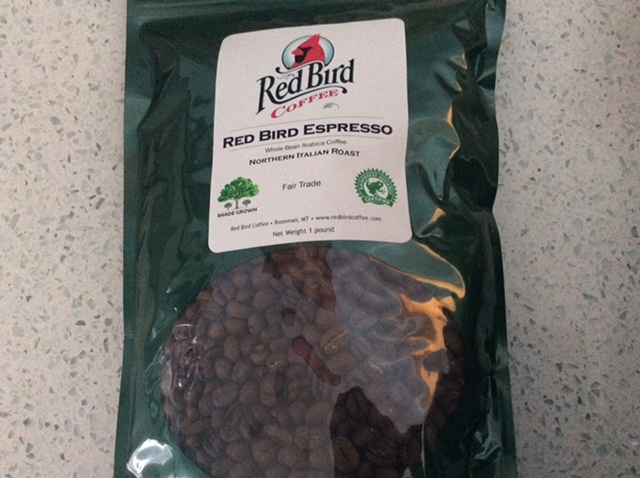 5 more pounds of Redbird Espresso will be headed my way in a week or two! 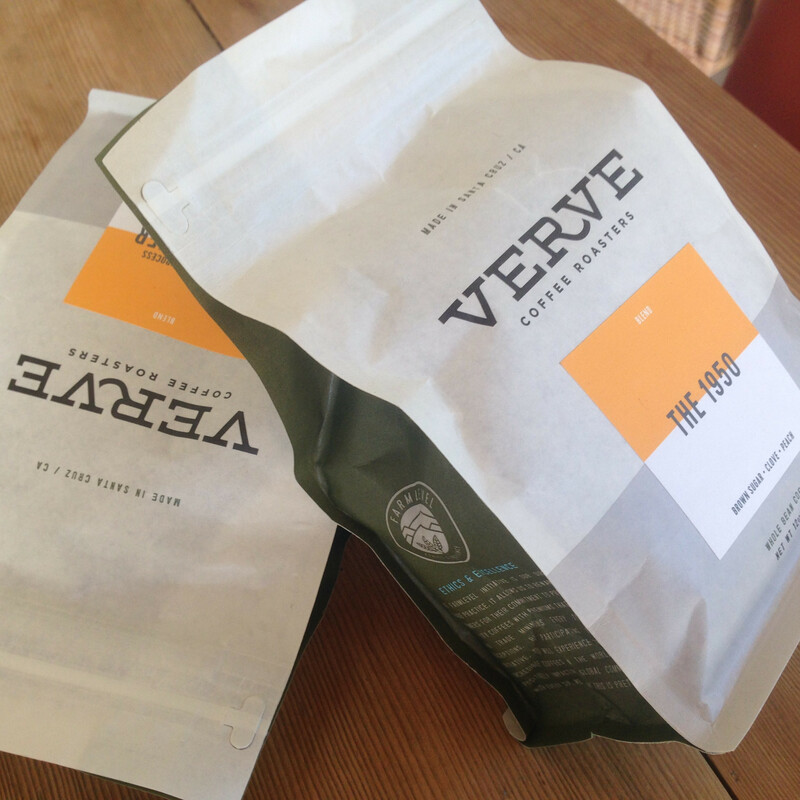 Also - not espresso, per se, but anyone looking at Redbird I can highly recommend the new Guatemalan. As an Aeropress I picked up a lot of brown sugar and chocolate notes, but there's something acidic in the back end that adds a nice mild complexity to the coffee. (02-27-2017, 08:37 AM)asiliski Wrote: i think i'll have to try some redbird myself. (03-02-2017, 11:16 AM)Gig103 Wrote: Nice! The Sweet Blue is really nice as a espresso. Chocolatey, nutty, balanced acidity and a light stone fruit (apricot, nectarine) poking through. No surprise it does tend to get a little lost in a cappuccino but is beautiful in a macchiato. I need to try the Red Bird espresso next. My typical drink is 1.5 oz espresso and an equal amount of steamed milk, so Sweet Blue holds up well in that. 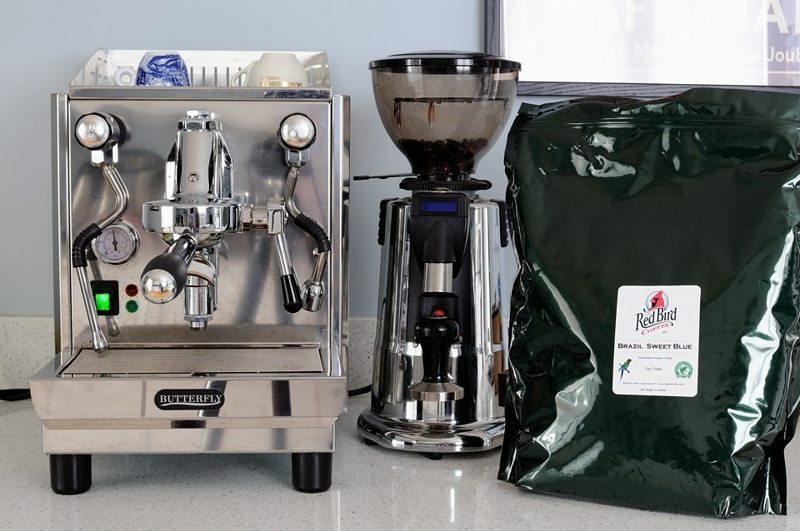 I never really got the Redbird blend to work for me...it was good but I never felt I maximized its potential. The Blue Jaguar was my go to blend for quite a while, easy to pull and tasty. These are interesting brands-- I've never heard of them. It kind of reminds me of the commercial vs. artisan soap world. I live in San Francisco, and we have some popular options locally: Ritual, Blue Bottle, Four Barrel, and Sight Glass. The oldest is probably Graffeo in North Beach (Little Italy). They only roast beans and do not have a cafe. I'm not as knowledgeable as others here, but I found their roasts to be quite good. I'd be curious if anyone else here has tried them. I haven't heard of Graffeo, but I will check them out. I prefer Italian style espresso roast, so sounds like they might be a fit. Your comment regarding commercial vs artisan is very apt. There are a lot of artisan roasters these days, and like soap makers, several have come and gone. Several, like blue bottle, have turned into commercial roasters. At the end of the day, its all good and there are a lot of premium coffee options out there these days. It's a great time to like espresso! I totally agree-- I'm looking forward to learning more. Still trying to dial it in. The 1950 is a lighter roast than I am used to. (03-06-2017, 03:40 PM)Watson15 Wrote: These are interesting brands-- I've never heard of them. It kind of reminds me of the commercial vs. artisan soap world. I live in San Francisco, and we have some popular options locally: Ritual, Blue Bottle, Four Barrel, and Sight Glass. All a matter of taste, of course, but your list may have left out the pick of the litter, Sweet Maria's. With a long history of being to home roasting and selected green beans what Mecca is to Islam, Sweet Maria's, not every day, sells roasted coffee (two varieties of espresso and two varieties of non-espresso, Sweet Maria's chooses the varieties), once every other week (until sold out), with the offerings available to purchase most commonly on a Thursday. 2823 Adeline Street in Emeryville (near McClymonds High School, not to be confused with a similar address near Berkeley Bowl). I'll check Sweet Maria's out Tom. Thanks for the tip. I didn't know they sold roasted beans. (03-13-2017, 03:56 PM)Mel S Meles Wrote: All a matter of taste, of course, but your list may have left out the pick of the litter, Sweet Maria's. In my case, I just hadn't heard of Sweet Maria's. I will definitely check them out. I watched their "mug-jug" YouTube video, which made me laugh. It reminded me of an episode of Portlandia. (03-13-2017, 05:08 PM)wreck | fish Wrote: I'll check Sweet Maria's out Tom. Thanks for the tip. I didn't know they sold roasted beans. 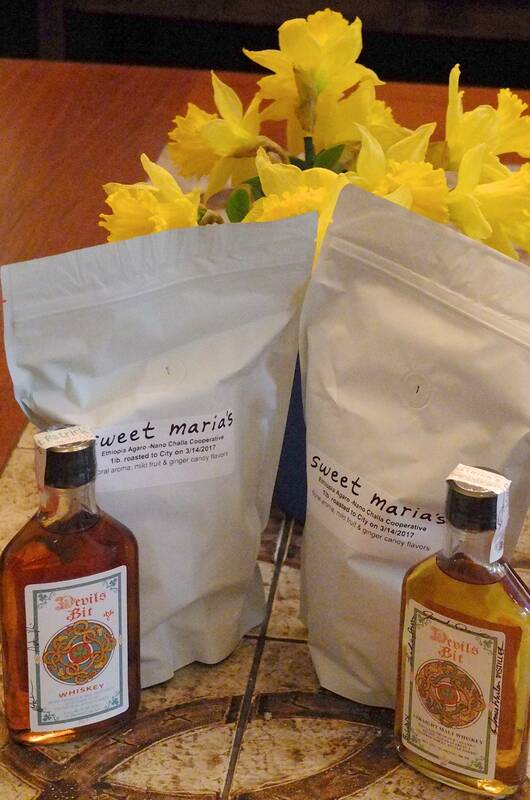 Over the weekend, I bought Sweet Maria’s last two one-pound bags of the March 14 roast of Ethiopia Agaro Nano Challa. McMenamins, like from McMinnville Oregon? They do liquor too? (03-21-2017, 12:39 PM)Gig103 Wrote: McMenamins, like from McMinnville Oregon? They do liquor too? They do. They have a distillery at the Edgefield Manor site near Troutdale. Chuck Cowdery, who is to worldwide — but especially American — whiskey what Michael Jackson (not the pop singer one) is to the narrower specialty of Scotch Whisky, regularly gives the Devil’s Bit releases fulsome praise. I guess the vibrant resurgence of distillers of spirits in Oregon in the past three or four years almost makes up for the change in the Portland coffee roasting scene. Long before Starbucks made Seattle famous, Portland was the center of specialist gourmet coffee roasting with Kobos and Stumptown and others. But David Kobos retired and his operation was purchased by Ground Swill Coffee out of Southern California, while Stumptown was purchased by the Dutch (Douwe-Egbert); and Portland’s remaining small specialty roasters (personal opinion: Badbeard’s Microroastery is the best of the currently active ones) have not yet been able to fill the void left behind from the loss of Kobos and Stumptown. Even though I missed the Devil's Bit I will keep this in mind on my next visit. And good knowledge and sad history about the coffee scene changing. I visited a third-wave coffee shop (Upper Left) and thought it fine but not amazing. I see Badbeard's is near the Costco, so that's another spot I will try. Thanks for the two tips! (03-21-2017, 10:53 PM)Gig103 Wrote: Even though I missed the Devil's Bit I will keep this in mind on my next visit. And good knowledge and sad history about the coffee scene changing. I visited a third-wave coffee shop (Upper Left) and thought it fine but not amazing. Badbeard’s roastery itself is in the area east of the airport (and not always “manned” for retail sales); but the coffees may be purchased at any of several locations of the small chain Market of Choice. I'd like to hear your impressions of the 1950 when you get a chance. I'm not usually one for light roasts as an espresso but this one sounds interesting. Just got this one in today. Appears my exploration of Redbird is continuing. Roasted on the 22nd so the timing looks perfect since I have a couple days of Vivace Dolce left to work through.